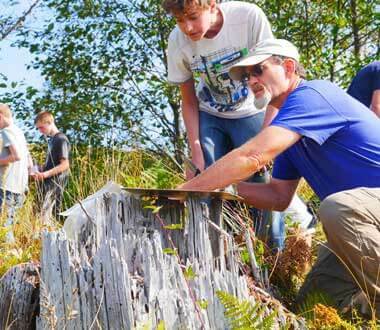 Education lies at the very core of the Institute’s mission and the Mount St. Helens Institute connects teachers with resources. 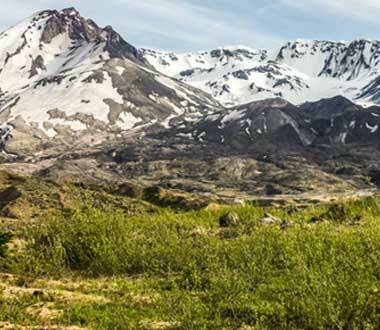 We have created these lessons for you to use to bring Mount St. Helens into your classroom. A printable set of Area Percent Estimation Cards, which range from 5% to 90% in 5% intervals. Great for practicing estimation skills or using in student field studies to gather ecologic data such as vegetation cover or canopy cover or for geologic data such as the percentage of sediment types. Stop that Sediment! is an on-paper engineering activity for the classroom targeted to 4th grade Next Generation Science Standards. Students work individually or in teams to design a solution to mitigate the ongoing hazard of excessive sedimentation in the Toutle River Valley and connected basins. Teacher provides an engaging introductory PowerPoint lesson. Students sketch and/or write their plans for their solution. 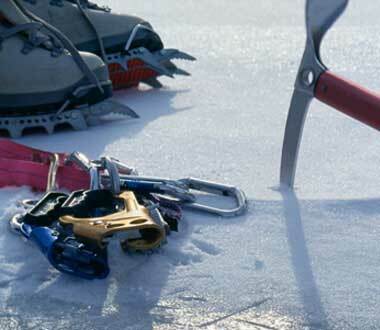 Students share, discuss, and evaluate their designs with the class or in small teams. Share, discuss, and evaluate designs with class or in small teams. Science and Engineering Practices: Constructing Explanations and Designing Solutions Students explain in their own words why excessive sedimentation is potentially harmful and design their own solution to mitigate this hazard. 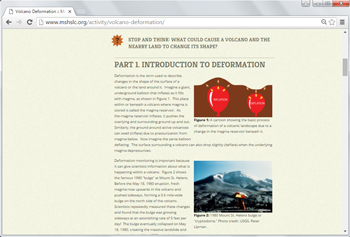 Students understand that not all volcanic hazards happen during eruptions. Ongoing, long-term sedimentation is a natural hazard that is difficult, if not impossible to stop. However, humans can reduce the impacts of (or mitigate) this hazard. Students design and itemize the supplies and/or services needed for their design. In describing their model, they must also describe why they think their system will be the most effective for mitigating the hazard of excess sedimentation. Students plan and carry out a simple investigation of removing vegetation in a plot and comparing to an undisturbed plot in the school yard. Through surveying the plots periodically over the course of the school year, students collect and then analyze data that can be used to make claims about succession and plant community re-establishment after a disturbance. Students explain in their own words why excessive sedimentation is potentially harmful and design their own solution to mitigate this hazard. Students understand the ecosystems and the species in an ecological community change over time and in response to both biotic and abiotic events. Students observe patterns in plant community changes to understand that small changes to an ecosystem can have long term impacts. 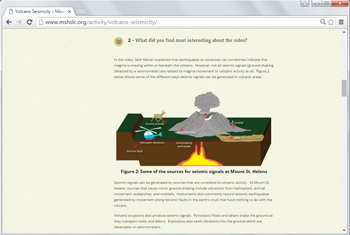 The Mount St. Helens Institute, in collaboration with scientists and educators from US Forest Service, Mount St. Helens National Volcanic Monument, and Western Washington University, have created a series of online lessons wherein students use realistic geologic data from Mount St. Helens to uncover what is happening inside a volcano and what the volcano might do in the near future. Lessons are targeted for middle-school students. LEARNING EXPERIENCE: These lessons require internet access. In the first three lessons, students will be trained on three different ways of monitoring volcanoes: deformation, gas emissions, and seismicity. In the final lesson, students will observe and interpret patterns and changes in a volcano’s shape, gas emissions, and seismic activity and use their interpretations to forecast volcanic activity! The first three lessons may be completed in any order, as they independently train students on three types of volcanic monitoring techniques. 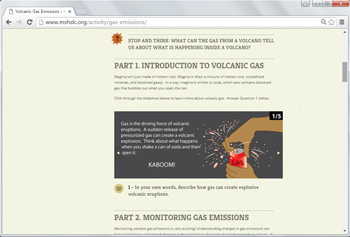 The fourth lesson (Forecasting an Eruption), requires students to synthesize the knowledge they gained about these three monitoring techniques in order to forecast volcanic activity; the fourth lesson should be used only after the first three are completed. Understand the real-world importance of monitoring volcanoes and communicating their observations and interpretations (setting the alert level and informing the public). Science and Engineering Practices: Analyze and Interpret Data, Engage in an Argument from Evidence Students will interpret data in all activities. 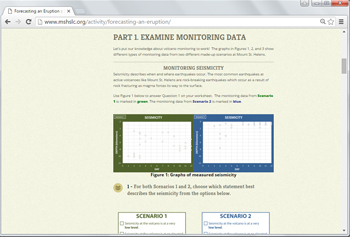 In the final activity, “Forecasting An Eruption,” students will interpret several types of contemporaneous monitoring data. Based on their interpretations, they will "set the hazard level” based on their interpretations. Setting the hazard level is a way of engaging in an argument from evidence that real scientists do! Humans cannot control volcanoes and the hazards they pose, but they can keep a close watch on a volcano through volcanic monitoring. Should activity at a volcano increase and pose danger to those living in its shadow, scientists can use their knowledge to inform decision-makers. In doing so, they can help prevent a volcanic eruption from becoming a volcanic disaster. Volcanoes are dynamic systems. Patterns and changes observed using volcanic monitoring can be reflective of important changes happening within a volcano. In these activities, students are presented with realistic data sets and are given the tools and knowledge they need in order to interpret the meaning of patterns and changes in a volcanic system, just as real scientists do! Help us make this activity better! Teachers: If you have used this activity in your classroom, please consider taking a few moments to provide us with feedback by filling out our survey (link below). We can use this feedback to improve these activities to better suit your needs.